!This is a post in progress. Working on a new pair of trousers, we have come upon some ideas about the installment of the zipper within the fly of the pants. Although there are undoubtedly an ever-expanding multitude of ways that one could perform this operation, there are only a few ways that we have done so with the Brother. Taking a close look at various pairs of jeans and slacks exhumed from the closet, one thing is clear, there are no two pairs of pants with the zipper stitched into the fly in the same way. 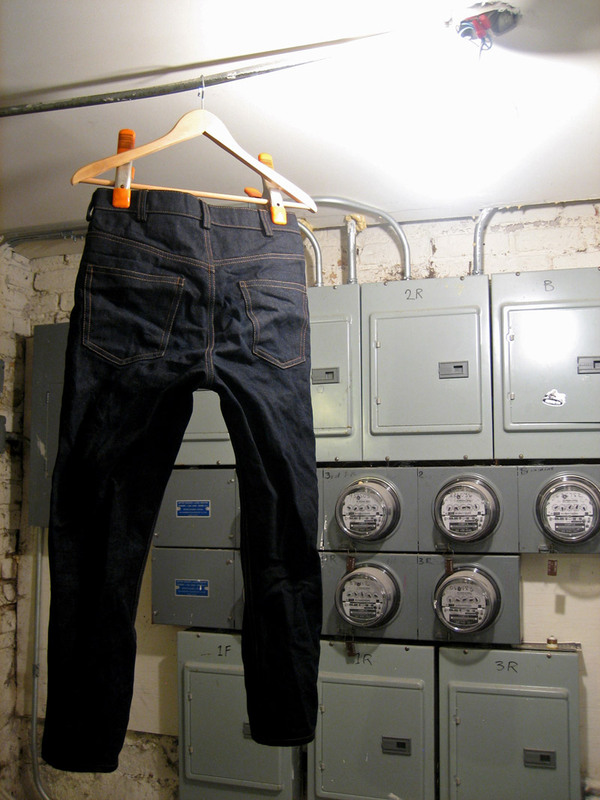 Even looking at two pairs of jeans that carry the same name and model number (albeit from different production runs most likely) reveals that the decisions made to install this crucial component as being a day-to-day, garment-to-garment, action. This would leave us to believe that the very finicky part of placing/stitching the zipper into the fly is left to intuition on the part of the master sewer at hand. While in the past, typically the whole zipper apparatus would have been assembled separate from the front panels of the given pants, this is now breaking away into a different method. The greatest problem of installing the zipper into the fly does not even lay responsibility on the zipper, but rather how this whole system integrates with the last few inches of what stitching is used to finish the front yoke (the area where the two front panels meet – forming the crotch just below the fly). This is perhaps the most peculiar intersection of all the garments, parcels, oddities, made with the B-r-o-t-h-e-r and it never ceases to baffle the mind. However, it will once in awhile become a little more transparent, showing a particular moment, or movement, that divulges its careful placement within the layers of fabric. With ten pairs of jeans made over the last several years, and one pair of shorts, it is now time to commence an eleventh piece. 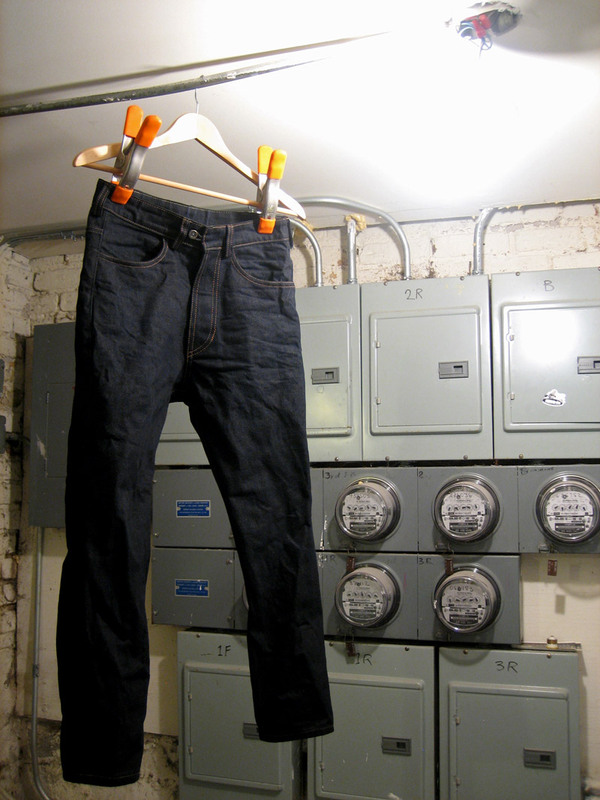 This one will take the shape of simple trousers, utilizing remaining denim. This is the same denim used to build two other pairs of jeans, one pair which has not been displayed on this site and the other, These Jeans ARE Silk. 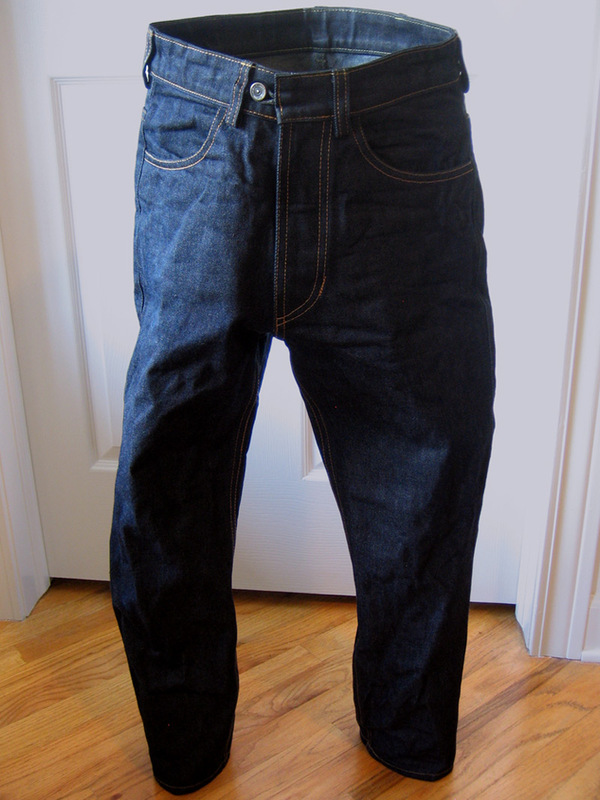 This rich-black denim is quite versatile, so it is a good time to use the last of it for something; A) other than a standard 5 pocket jean B) something that can be worn like a dress-trouser, and C) to use this test to refine the pattern, which can later be folded back into a 5 pocket jean with a few alterations. Hence arriving at the pattern. However strange or unprofessional this may sound, all the previous pairs of pants/shorts built to this date have been based on the ripping of an elder pair of jeans. Simply put, the pattern is based on a pair of jeans that were carefully seam-ripped all the way down to the singular parts (!not including un-weaving the denim itself). As you may guess this has resulted in somewhat varied results as the factors have not been as concrete as they should be. Rather than taking measurements, the pattern has evolved through feel and intuition, and by carefully examining other pairs of pants that are still in-tact. With that said however, as these pants/shorts have been built the pattern has become more precise, and has become more measured and intrinsically aware of it’s shape. The pattern is now an ethereal substance that has a fluid-like body traveling through all the garments at once, and never standing still in one place. It is thoughtful and flexible, and reaches out to all areas of the sewing-arena in the work that come into contact with the Brother DB2-B791-015. To restate what was mentioned before, the pattern has called for an exact impression of how the zipper will be integrated into the fly and then on into the foundation of the crotch. Why this installment procedure has come to stand out so much is due to a few extraneous ideas, and because it is crucial to pant-construction. This fascination became even more consuming when we realized that in order to make a crisp pair of slacks, we would have to work through multiple tests, or drafts, in order to find the simplest way. And the most important aspect of that would be to devise a way to incorporate all the zipper – fly – crotch components together sanely, and continue to use this method for all the tests. Therefore creating a controlled variable, dissolving any unnecessary tom-foolery of this important step. The initiating factor of the zipper placement within the fly, was the simple problem of where does the zipper lay into the components; is it dead-center, off to the right, or off to the left, of the two individual fabric pieces that house the zipper (one piece being the long rectangular shape, and the other being the scabbard, or sheath-like shape), etc., etc.? If, when one is drafting a pair of pants and will be making multiple prototypes, it is imperative that each time they sew the next iteration together, that they do so in the same way, especially when sewing the two front panels together – creating the fly and crotch. In the past, we would always lay the zipper down in the center of the long rectangular shape first, stitch that in place, and then turn-over and stitch the corresponding side of the zipper to the sheath-like shape. At this point the three separate pieces would become one, to be mated to the front panels by first stitching in on the right-front panel, and then stitching in on the left-front panel. All of this slowly working its way to the crotch; turning things in and out to make sure that nothing would be sewn shut, or left open. Thus in the recent prototypes, the first question of this paragraph has finally been addressed. After looking at many pairs of pants, it seems that the most consistent method of placing the zipper has to do with the initiating stitch (which in some cases acts as a basting stitch, as it is for construction only and does not become a top-stitch) binding the fly’s inner-facing (the rectangular piece) with the front-right panel, along the center-front (CF) seam. The zipper is tucked into this seam allowance (built at 3/8″) and then re-opened to run top-stitching along the edge of the joint between the zipper tape and the face/right side of the fabric. So, to clarify, the zipper starts where the front-right panel is stitched to the inner fly-facing – and the zipper runs along this edge, therefore it is as far to the right as it can be within the fly apparatus. Everything else expands from there. It is such a hands-on application, one that requires an ability to imagine abstracted space. Thus a text-tutorial is almost worthless, or possibly not. For obvious reasons this point in the process of making a pair of pants is hard to describe without imagery, and we hope to eventually post such imagery (just haven’t yet) but until then – the idea of listing the steps seems a bit flawed. However, to our other point perhaps because it does indeed rely on exploration and abstraction of spatial concerns, maybe writing the procedural side of this action is best because one can only build from their own base, no text, or image-text can ever explain everything at once, clearly, and sufficiently. This comes down to tacit knowledge, something the needlefeed constantly leans back upon. The only sure method for relating this information is via physical contact. With that said, There is one other issue that has come about. Depending on wether or not you are building jeans with a double lap felled seam, or trousers with a simple seam also drastically alters the process, and how it incorporates or consumes that last little section between the fly and the point of intersection between the inner-leg seams.